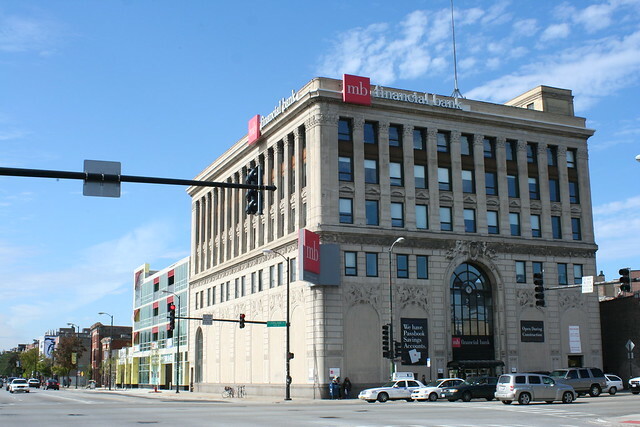 This is the former MB Finanacial Bank building, 1200 N. Ashland Avenue, as it used to look. 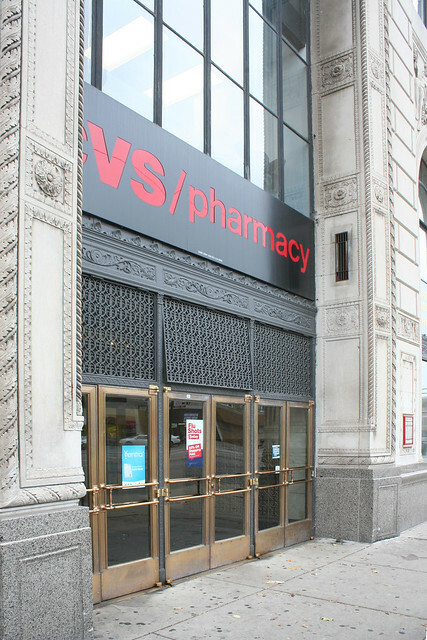 And here it is today, after a CVS moved in some time around 2010. 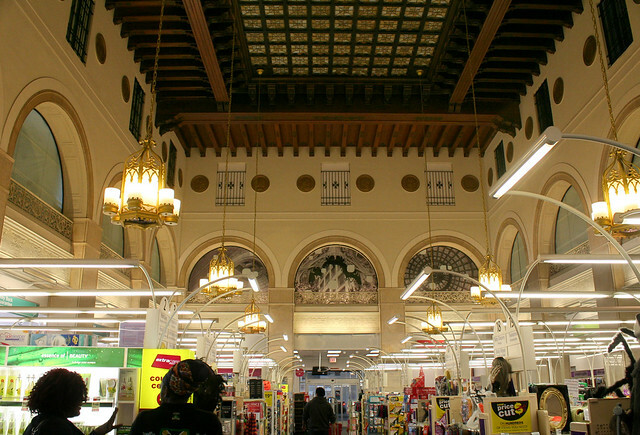 No cruddy dropped ceilings or bland remodeling here – the CVS was simply dropped onto the existing banking floor, while all the architectural splendor around it was left intact. 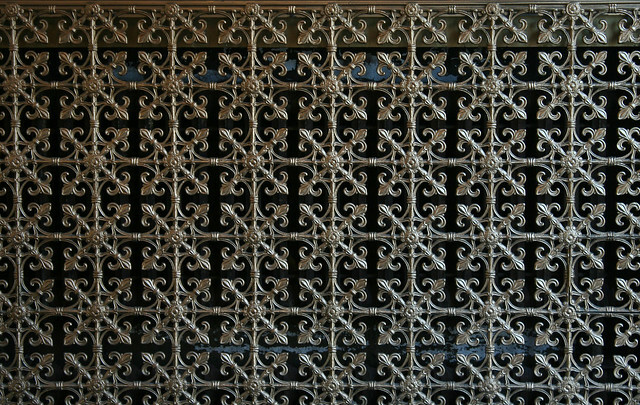 The detailing of the bank lobby is magnificent. 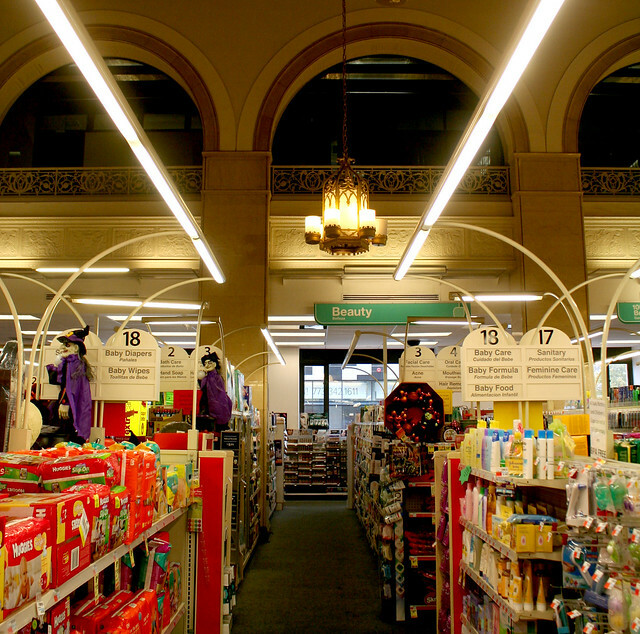 From the wood beam ceiling, to the plaster moldings, to the still-intact chandeliers, CVS has done a remarkable job of leaving well enough alone. The outside of this place is something special, too. 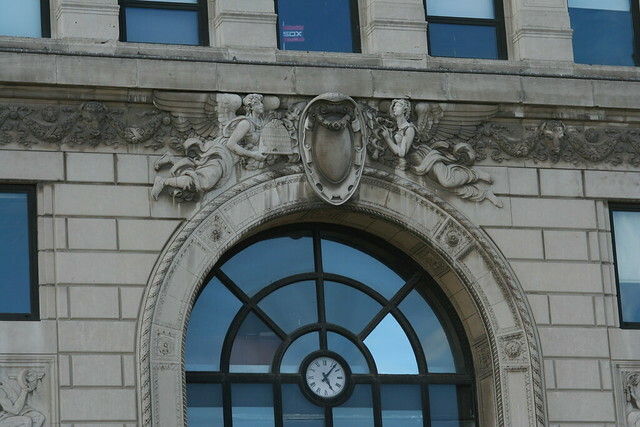 Bas relief sculpture lines the walls between the arched windows. Check out the signs of the age – from a ship’s wheel to a winged car wheel. 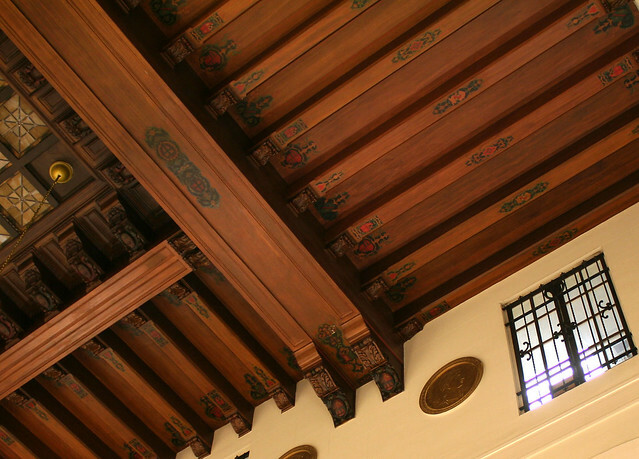 This handsome classical bank building was originally the Home Bank and Trust Company, designed by architects K. M. Vitzthum & Co. in 1925, and built at a cost of $1,000,000, with three floors of office space above. Home Bank was one of a spate of outlying banks opened in the years before the Great Depression, serving neighborhood needs – in this case the heart of Chicago’s Polish community. 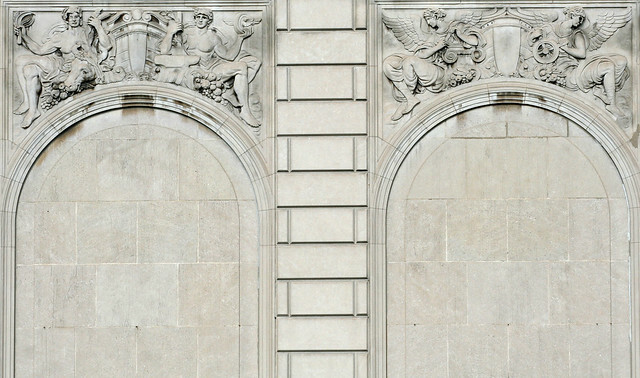 Despite merging with Northwestern Trust and Savings, the bank was killed off by the onset of the Depression in 1930, and a successor bank – United American Trust and Savings – only lasted another year. 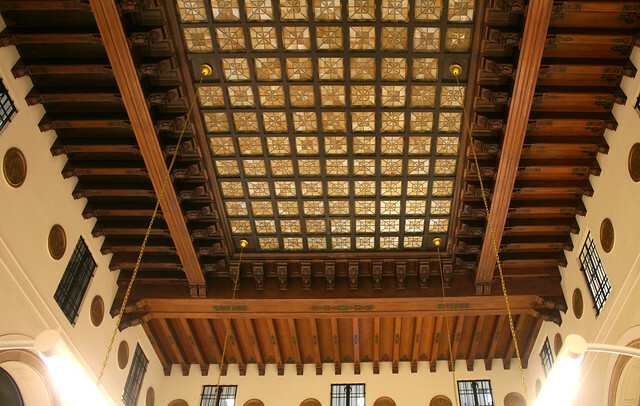 In 1934, a stable legacy began when the Milwaukee Avenue National Bank opened its doors at Ashland and Division, supported by over 2000 depositors from the previous bank on the premises. 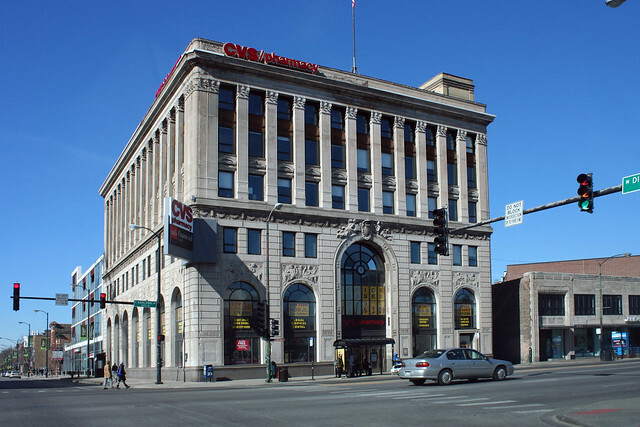 With a 1946 name change, it became the Manufacturers National Bank of Chicago, with its name shortened to Manufacturers Bank by 1984. A 2001 merger with Mid-City Bank created MB Financial, who soon built their own headquarters downtown. 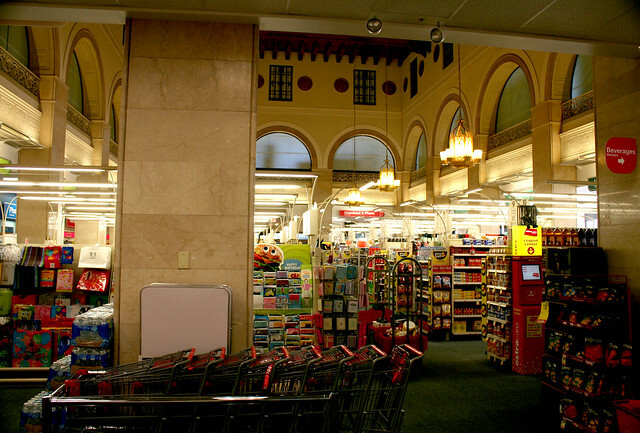 The building was designated a city landmark in 2008; CVS opened its doors in 2011. 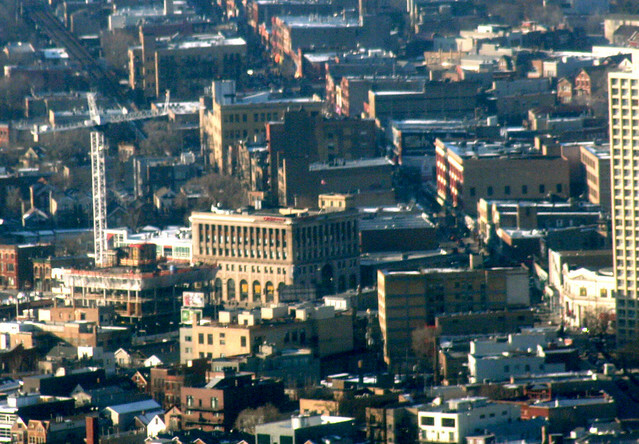 This entry was posted in Aerial Photography & Views from High Places, Pre-War Commercial Buildings, Preservation & Renovation. Bookmark the permalink.